"We have been to Bali many times and the BSMP is by far the most fun place we have visited on the island. We were excited to come, but the actual experience was even better than we expected, which doesn’t happen often.. The Bali Agung show is amazing - the production standard is world class, and way beyond our expectations; my boys are still taking about Chloe the orang-utan (as is my wife!) and the tigers climbing above us, literally centimetres away thru our cage during the night safari was another awesome experience. Kind of like a shark cage experience, on land.. The water park was just yet another added surprise that thrilled the kids. We stayed over night as well which meant we could see everything in good time - and I highly recommend doing this. 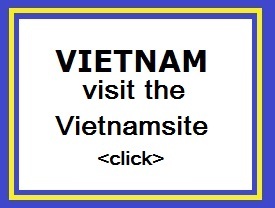 Very helpful and genuinely friendly staff. Love it!" The Bali Safari & Marine Park has a large collection of 400 animals from 80 different species of wild animals, all of which are freely walking around as if they live in their protected natural habitats. These animals come from three regions - Indonesia, India and Africa. Among them are spotted deer, Himalayan bears, nilgai (large antelope), black gazelles, African hippos, zebras, camels, ostriches, baboons, blue wildebeest and lions. 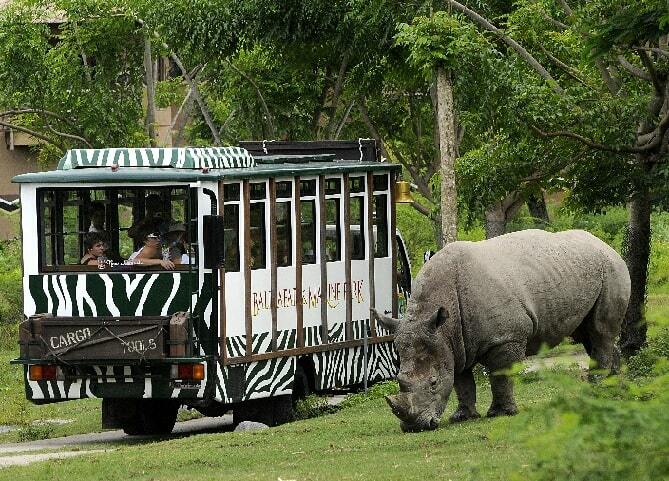 Tourists, who stepped on board one of the safari bus, these animals can be seen in different parts of the park. The animals roam freely and sometimes near the buses. Ranthambore is a replica of an ancient Indian fort in Rajasthan, where the majestic white tigers roam. Kampung Gajah (Elephant Village), a habitat for retired working elephants. There are also a number of rare and endangered species such as the Komodo Dragons, the Orang Utan's, white tigers and the Bali Mynah. Furthermore, you can walk around in this lovely park, taking pictures of one of the many animals and enjoy the elephants. You have the opportunity to feed these elephants with carrots and bananas, super fun for the kids. The roots and bananas can be purchased on the spot. Several wildlife conservation organizations in Indonesia are actively involved with the animals in the Park. They do this to ensure the survival and welfare of many endangered Indonesian species by engaging education to visitors and protection programs. 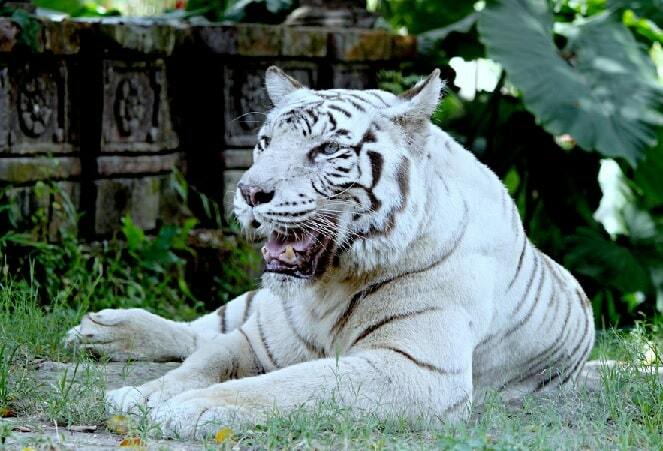 This endangered species include the Bali Mynah, Sumatran elephant, and the Sumatran tiger. You'll enjoy a ride in a safari bus to look at the animals, look also at the fascinating elephant talent shows, cuddle with baby orangutans and admire the baby sharks in the Marine Park. Furthermore, there are the thousands of colorful fish aquariums, piranhas and turtles. There also many shows with the animals in the park. The entrance fee for an adult is 49 US. The fee for children is 39 US. Children will have a wonderful day in the Bali Safari & Marine Park! "The animals all seem happy and you can hold feed so many of them. It's worth the expensive ticket. Seriously. It's so much money, but if you want to any of the things when you get there it costs double the price once you're in the gates. 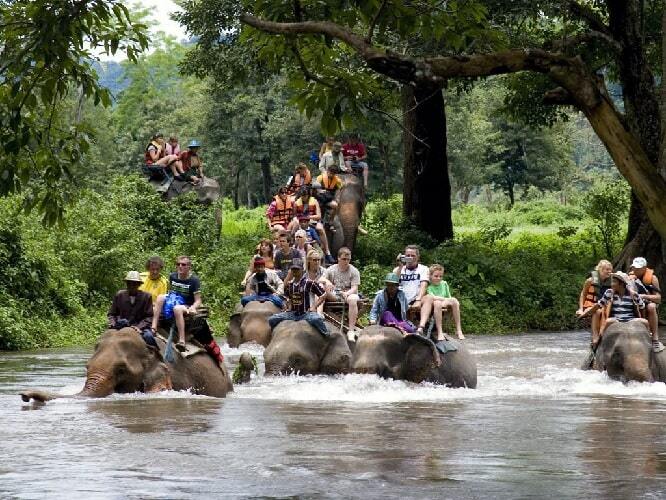 Feeding the elephants, riding elephants, holding an orangutan, Patting a lion... the list goes on! There are Elephant rides, Elephant feeding, Baby Oran-Utan holding (free), Tiger touching, Snake holding (free), and a fantastic animal education show (free)! There are other animals, like the Cat-Bear, out and about and free to touch. There is a huge range of animals there to see, Kimodos, Porcupines, Hippos, Zebras....the list goes on. All in great health and kept in fantastic conditions (much closer to natural habitat than anything I've seen in Australia). They do NOT allow you to bring any food or drink inside the park, and yes, they search your bag on entry. We couldn't even get a half eaten chocolate bar in! The prices for food and drink once inside are outrageous, for example, $6 for a meat pie, and $5 for a cup of tea!!! I'd recommend having a big breakfast, and only buying water once inside - OR buying a package deal on entry that includes lunch, these deals seemed very reasonable. "